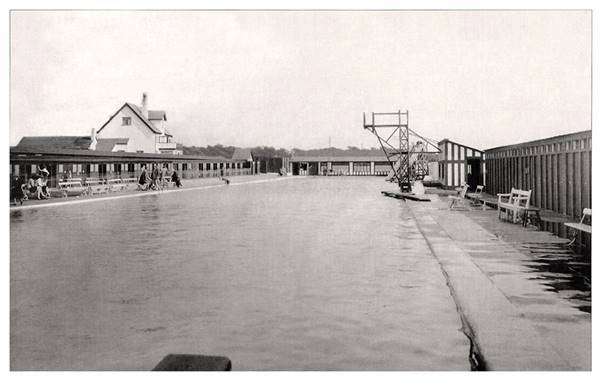 The old Parkgate open air swimming baths were built by Mostyn House School in 1923 and situated beyond the end of the North Parade; they supplied with filtered salt water from the Dee Estuary. They were also open to the general public and proved extremely popular during the inter-war years. When war appeared inevitable, they were sold in 1939 to fund the building of a fully equipped air raid shelter in the school grounds. During the war years the water supply and filtration system struggled to cope with the encroaching marsh. 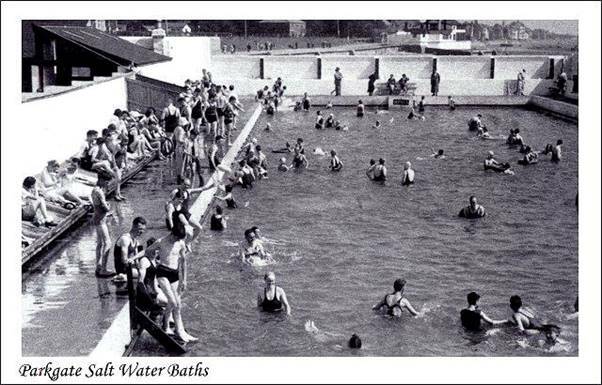 In 1950 the baths were closed never to re-open. The small pool shown here was added in about 1930. You can just about make out the Boat House Cafe in the distance. By 1973 the baths had been filled in and the site incorporated into the Wirral Country Park. Parts of the original walls still remain, forming a boundary to the car park. Both the Wirral Country Park and the RSPB have information boards at this location overlooking the marsh. These explain the origins of the park and the wildlife that can be viewed here.